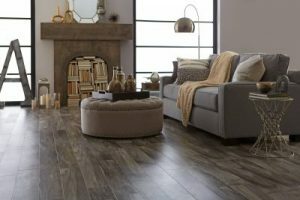 There is a new flooring product on the market by Shaw Flooring that is turning heads and dropping jaws. Imagine a wood look-alike that is resilient and waterproof – suitable for ground or below ground levels. This product is called Floorte, and it’s the flooring material that simply makes sense in a finished basement or high-moisture area such as a bathroom, mudroom, kitchen or laundry room. Compared to solid hardwood floors, or even engineered hardwood floors, Floorte installation is a breeze. With a fold-n-go locking system, the planks are easily installed and flexible, concealing imperfections of the subfloor. Overall, less floor prep is needed saving the end consumer on labor and subfloor materials. For those of you with children, grandchildren or even furry friends, the Floorte product will make accidents an effortless cleanup. Scratches? Not a problem with this product. The vinyl substance can endure pet claws or heavy foot traffic without any buffing, sanding, or worse – replacement. If the resilient features of the product aren’t enough to win you over, visit ACo’s showroom to check out all the available widths, styles and finishes. With three Floorte product levels, there are more than 67 styles and color combinations. Concerned about the visual and negative stigma of years past vinyl plank floors? Shaw Flooring uses high-definition printing that mimics high-end species and colors of hardwood, as well as fossilized wood, stone and concrete materials. For those of you in a commercial setting, there is also Floorte Pro – engineered for higher performance and higher style. Whether you are considering a floor replacement in the near future or in the next few years, keeping this durable product in mind could save you headaches of preparation, maintenance or replacement of a standard vinyl plank or hardwood. For all your flooring needs, be sure to contact a design professional at ACo by visiting our website liveaco.com or give them a call today at 317-575-9540.